Sour Tsunami is one of the first strains bred specifically to be a medical strain. It is the creation of Lawrence Ringo of The Southern Humbolt Seed Collective. It took four years of breeding to perfect this strain. Sour Tsunami is said to have been bred to treat Lawrence Ringo’s back pain. This story may have some truth to it. The high CBD levels can reduce pain and inflammation to a high degree. 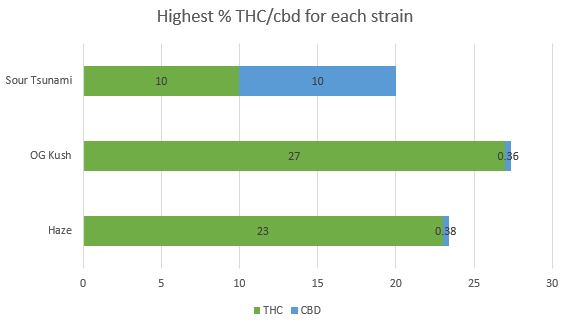 Also, some varieties can have 1:1 THC to CBD, so THC isn’t entirely absent and works synergistically with the CBD to produce relief of pain and inflammation. Indoor/Outdoor Yield You can get 16 ounces per meter squared indoors. 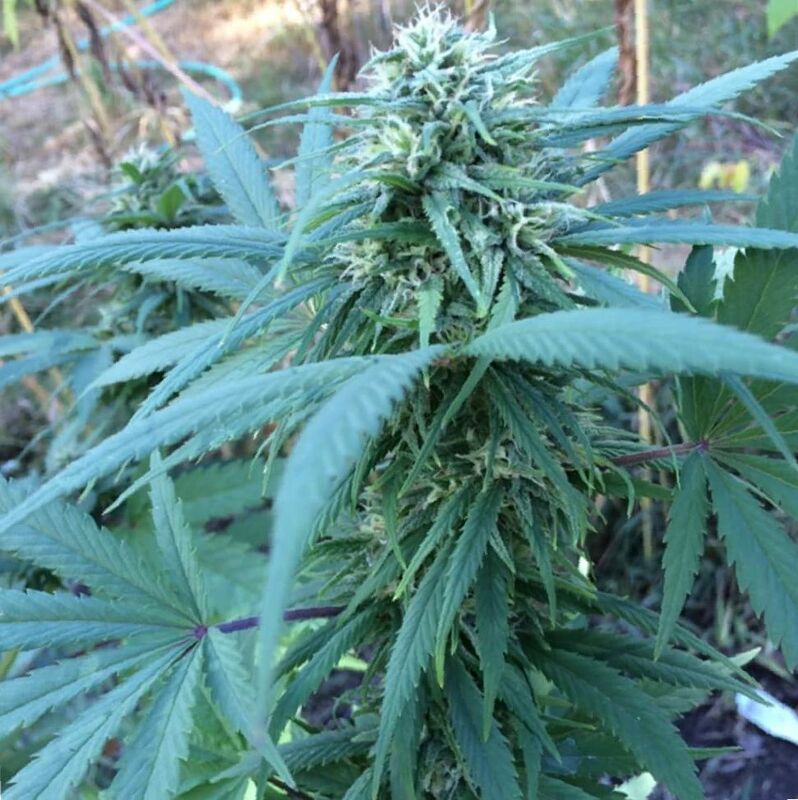 Growing outdoors in a sunny environment, you can expect 16 ounces per plant. Flowering time Sour Tsunami buds will flower indoors in about 63 days. Harvest Sour Tsunami weed plants will be ready for harvesting outdoors in October. Disease resistance Sour Tsunami has a significant amount of disease resistance. Plant Height Sour Tsunami marijuana plants are tall, growing in excess of six feet tall. Adverse effects Sour Tsunami has few adverse effects, due to its high CBD levels and low THC levels. It can cause mild dry mouth and dry eyes. It has little addiction, dependence, and withdrawal potential. It causes little high. Sour Tsunami is a strain bred from New York City Diesel and Sour Diesel. It was created by Lawrence Ringo of The Southern Humbolt Seed Collective. He created it to treat his back pain and it is one of the first strains known to have been bred specifically for use as a medication. It has anywhere from zero to ten percent THC, and ten to eleven percent CBD. The high CBD levels are thought to provide the therapeutic effect. Sour Tsunami is a tall plant, it will grow beyond six feet tall. The buds have a Sativa structure, large and fluffy. 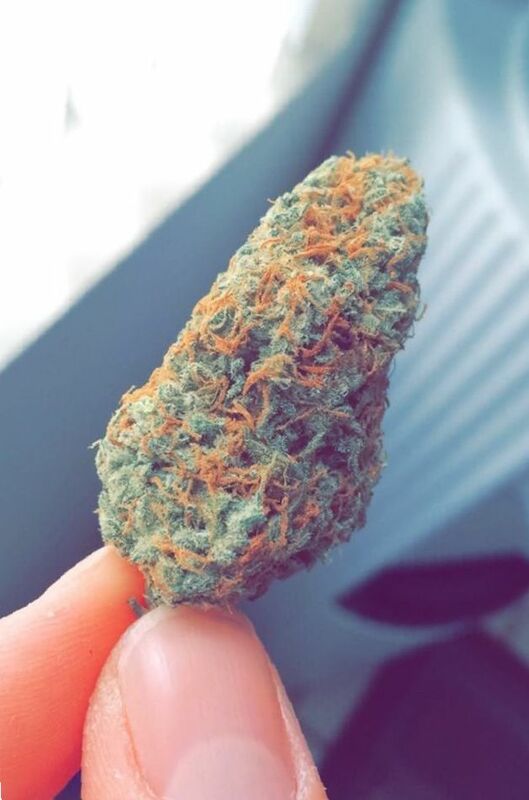 In the picture above, you can see the myriad colors in this strain. Light and dark green leaves and buds, sticky white and green resins, and curly orange pistils throughout. Those resins carry much of the THC and CBD. The aroma of Sour Tsunami is an homage to its parentage. 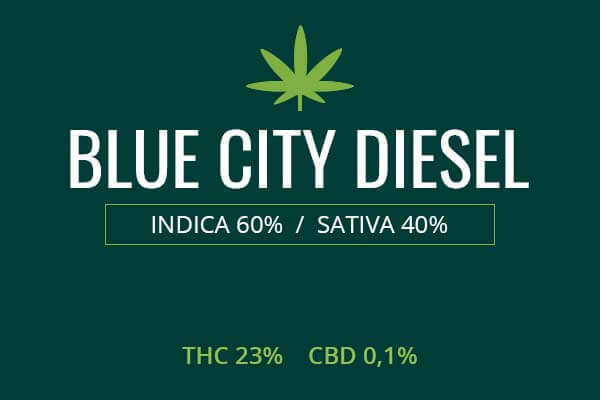 There is the contrast of sweet to diesel, reminiscent of the contrast of THC to CBD. The sweet scents present as cookie, pie, chocolate, and ginger snaps while the diesel is like a kick of chemical and gasoline. The aroma therapy alone will relax you. Growing weed from Sour Tsunami cannabis seeds or cuttings is said to be fairly difficult and requires an expert level of knowledge. 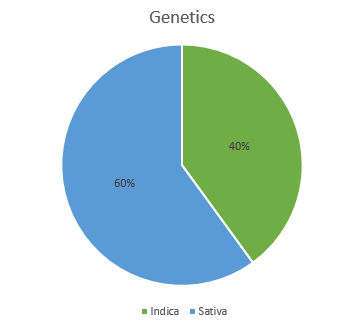 When you grow a CBD rich strain, the genes are unstable because they are far from their unbred state, so there’s only a 1 in 4 chance that you will get the high CBD levels you are seeking. Therefore, you will have to grow from a handful of high CBD strains or use a cutting. Once you’ve got your high CBD cutting, you’re ready to roll with your clone. You can grow this variety in a green house. Growing in a green house can give you the best of both worlds as a grower. You can plant directly in the ground, getting the advantage of direct connection to the earth, or you can grow in flower pots, as if you were growing indoors. A green house allows you to control the temperature, air, and humidity to a greater extent than growing outdoors. You also have greater control of the lighting and you can extend the growing season if you wish to. In a green house, you can get a yield of 16 ounces per plant. Growing outdoors, you need to find a spot which gets plenty of sunlight. You want to plant away from pests so that you don’t have to use heavy, toxic pesticides. You want a place where the air will remain fairly clean and dry, rather than muggy, and the soil will keep moist rather than soggy. So, be strategic, watch where rain water goes and makes sure you don’t plant where water will pool or moisture will fail to evaporate. You can expect to get about 16 ounces of weed per plant. Growing indoors will allow you full control over the environment. You can grow in 5 gallon flower pots with organic soil and fertilizer such as Flower Power. Use a tent and place reflective lining around the inside so that the light from your high intensity lamps will bounce around and focus on your leaves from every angle. You can use a fan and exhaust system with an air filter and humidity monitor to keep the air clean and dry. Expect your plants to flower after about 63 days. You can get a yield of about 16 ounces per square meter. Sour Tsunami is a 60 percent Sativa and 40 percent Indica with up to 10 percent THC and 10 percent CBD. It was created specifically for medical purposes. Lawrence Ringo, its breeder, claims he created the strain to treat his back pain. 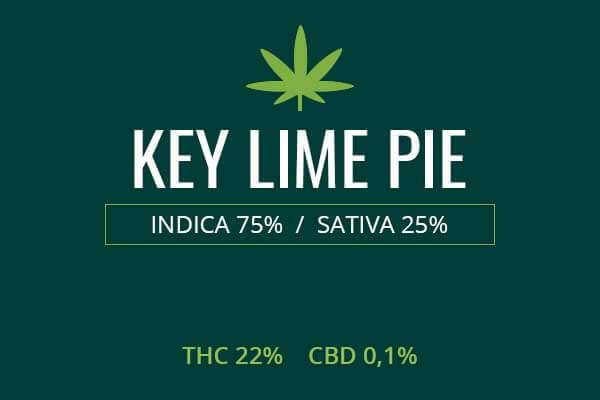 With CBD levels coming up to ten or eleven percent, this strain is great for treating muscle pain such as back pain. CBD is known to be able to reduce inflammation and to also provide immediate pain relief. CBD is a non-psychoactive cannabinoid which occurs in small amounts in most strains of marijuana. It is known to be able to control some types of seizures, and to have anti-psychotic effects, opposite those of THC which can have pro-psychotic effects. Conditions like fibromyalgia and polymyositis which feature inflammation of the muscle and muscle nerve cells may also be eased by Sour Tsunami. 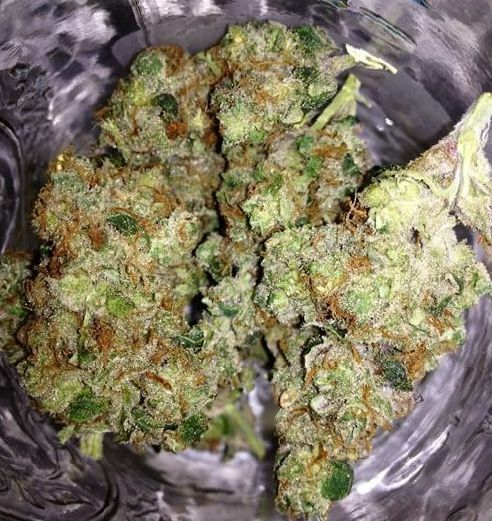 One great advantage of this strain is that it will cause little high so you can use it for pain and continue to go about your daily chores or work. Depending on the strain, it may have up to 10 percent THC. THC can also provide some pain relief, so strains with 1 to 1 CBD to THC can have potent pain relieving effects with very little impairment of your ability to function and be productive. Sour Tsunami can also control nausea. Both THC and CBD can have some anti-nausea properties. Some people, however, appear to react with vomiting to the presence of THC. Therefore, a low THC strain may provide superior control of nausea to those who are sensitive to THC but need the route of administration of smoking to control severe nausea. Thus, Sour Tsunami shines as a medical strain for the treatment of various ills. This is also a good strain for headache and insomnia. Unlike a strain with high THC, this strain will not cause overstimulation which could exacerbate a headache. It is a relaxing smoke which will leave your brain and thoughts in tact while clearing away the pain of a headache. This strain can be good for a late night smoke to help you get to sleep. The light THC levels as well as the CBD can help you to retire into a peaceful slumber. You will have less night time awakenings and wake up feeling more re-energized. 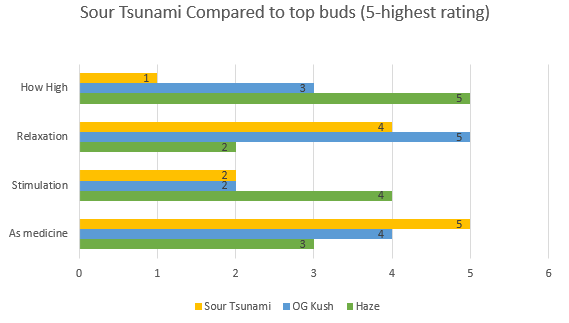 Sour Tsunami will have either mild or no recreational effects. 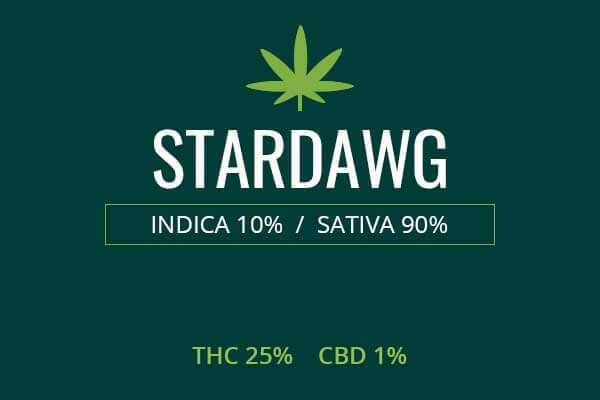 Strains which have 10 percent THC may provide a mild buzz, great for relieving chronic stress and tension, and having a thoughtful conversation with loved ones or friends. 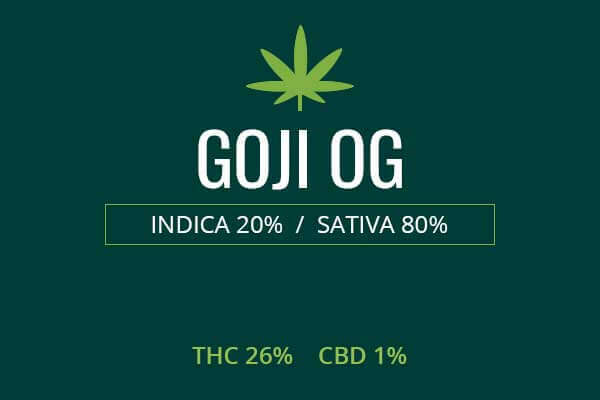 You can use this strain to relieve pain to allow you to work on a project, whether mental or physical. Your abilities and thinking will be in tact and your pain and anxiety will melt away. This is the perfect get work done strain. Yet, don’t operate heavy machinery, as you still have marijuana flowing through your body.